How Do Roots of Plants Grow In Outer Space With Zero Gravity? An experiment in the International Space Station was conducted to study the growth of plant roots in outer space in a zero gravity environment. The root is the organ of the plant that grows typically into the soil to extract water and minerals for the plant's nutritional need. 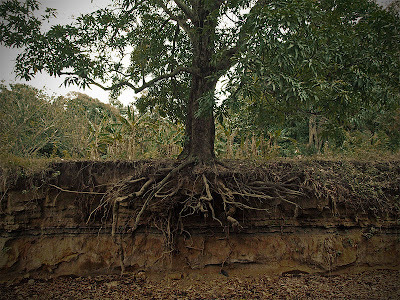 Roots grow depending on physical barriers, quality of the surrounding environment, and soil conditions. Some roots are aerial meaning that they rise above the ground. But most conventional root systems grown into the soil which aside from extracting nutrients, provides a stable anchor for the plant or tree to grow. The experiment on the International Space Station (ISS) was conducted to determine if gravity is a factor in the growth and spread of plant roots. This was done to verify the long held belief that gravity also affects the way a root spreads into the soil. The International Space Station is an international collaboration to provide a suitable environment for space experiments. It is 109 meters (357 feet) in length and has a habitable space of 388 cubic meters. Its habitable space is comparable to a five bedroom house. Aside from its high tech instruments, The ISS also has a gym and a 360-degree bay window. It is well known that plant growth patterns are influenced by a variety of stimuli, gravity being one amongst many. On Earth plant roots exhibit characteristic behaviours called 'waving' and 'skewing', which were thought to be gravity-dependent events. However, Arabidopsis plants grown on the International Space Station (ISS) have proved this theory wrong, according to a study published in BioMed Central's open access journal BMC Plant Biology: root 'waving' and 'skewing' occur in spaceflight plants independently of gravity. In plant roots, 'waving' consists of a series of regular, undulating changes in the direction of root tips during growth. It is thought to be associated with perception and avoidance of obstacles, and is dependent on gravity sensing and responsiveness. 'Skewing' is the slanted progression of roots growing along a near-vertical surface. It is thought to be a deviation of the roots from the direction of gravity and also subject to similar mechanisms that affect waving. Even though the precise basis of these growth patterns is not well understood, gravity is considered to be a major player in these processes. To test what happens to plant root growth when you remove gravity entirely, a research team from the University of Florida, Gainesville, USA, grew two types of Arabidopsis thaliana cultivars - Wassilewskija (WS) and Columbia (Col-0) – on the ISS. The plants were grown in specialized growth units that combined a plant habitat with a camera system which captured images every six hours. Imaging hardware delivered the telemetric data in real-time from the ISS, and comparable ground controls were grown at the Kennedy Space Centre. The phenomenon of negative-phototropism in plant roots is well documented, but its role in orienting root growth is still being explored. The authors found that, in the absence of gravity, but in the presence of directional light, spaceflight roots remained strongly negatively phototropic and grew in the opposite direction of the shoot growth, as they do back on Earth. The path taken by the roots as they grew also retained the complex patterns of waving and skewing, characteristic of Earth-grown, gravity-influenced, roots. Furthermore, while in orbit, each cultivar retained its unique terrestrial skewing pattern. However, the team observed that the degree of waving exhibited by the plants in space did not match what would be predicted for roots showing an equivalent amount of skewing back on Earth. In space, waving was far more subtle. This result reinforces the idea that waving and skewing represent two separate phenomena, and that gravity is not a mechanistic part of the basic waving and skewing processes. Lead authors Anna-Lisa Paul and Robert Ferl commented "Although plants use gravity as an orientating tropism on the Earth's surface, it is clear that gravity is neither essential for root orientation, nor is it the only factor influencing the patterns of root growth. It seems that other features of the environment are also required to ensure that a root grows away from the seed, thereby enhancing its chances of finding sufficient water and nutrients to ensure its survival."